These stealthy cats avoid humans and hunt at night, so they are rarely seen. So if you’ve had the opportunity to see one of these animals while in Canada then consider yourself very fortunate. The lynx is a solitary cat that haunts, stalks and hunts in our remote northern Ontario forests in and around Wawang Lake Resort. Although we’ve been at Wawang Lake for over 40 years now we have actually only seen these animals a few times. Lynx are covered with beautiful thick fur that keeps them warm during long, frigid Canadian winters. Their large paws are also furry and hit the ground with a spreading toe motion that makes them function as natural snowshoes. The Canada lynx is a good climber and swimmer; it constructs rough shelters under fallen trees or rock ledges. It has a thick coat and broad paws, and is twice as effective as bobcats at supporting its weight on the snow. 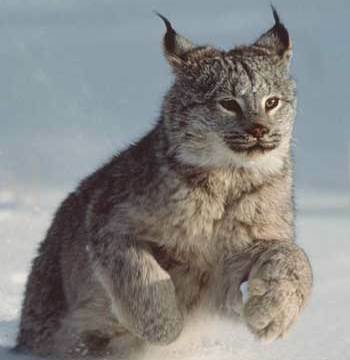 Lynx eat mice, squirrels, and birds, but prefer the snowshoe hare. The lynx are so dependent on this prey that their populations fluctuate with a periodic plunge in snowshoe hare numbers that occurs about every ten years.